Mobility Devices Manual Chairs, Scooters and Small Power Chairs up to 350 lbs. 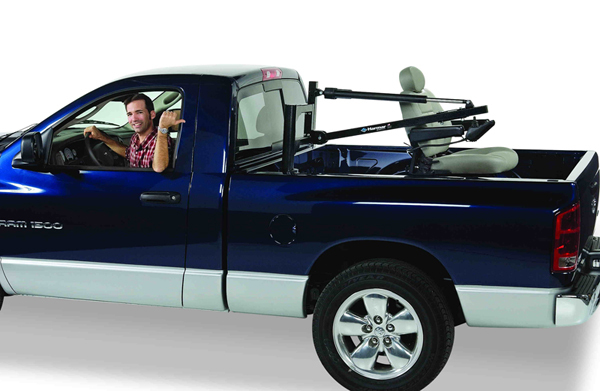 The Pickup 350 HD Truck lift is designed especially for truck owners with exceptionally large, heavy scooters and power chairs. With added clearance and reach for superior performance, this lift system uses less motors than other lift brands to keep operation simple for you. Featuring an anti-rotate strap system and compact base for an ideal fit in your truck's bed, the Pickup 350 HD can load and unload any mobility aid with ease, delivering it directly to the driver or passenger! Optional wireless remote also available.